On April 18, consider setting your scanner or handheld VHF radio to 145.80 MHz around 15:57 UTC; you may be able to hear the downlink from the International Space Station. The Amateur Radio on the International Space Station (ARISS) contact will be between between NA1SS (on the ISS) and KD2IFR at a school in Central Islip, NY. The frequency of the downlink will be 145.80 MHz. As the ISS climbs above your horizon, because of doppler-shift, listen on 145.805, then move to 145.80 as the ISS approaches zenith and finally move to 145.795 MHz as the ISS drops toward the other horizon. As we’ve mentioned in past posts, you’ll know when to switch frequency when the audio gets bad. ARISS contacts happen quite frequently–I’m posting this notice because I’ve noted it in my own calendar. Check out the ARISS “Upcoming Contacts” page where future ARISS QSOs are listed. This is a great opportunity to show kids of all ages what you can hear with a modest radio! An International Space Station school contact has been planned with participants at Central Islip Union Free School District, Central Islip, NY on 18 April. The event is scheduled to begin at approximately 15:57 UTC. The duration of the contact is approximately 9 minutes and 30 seconds. The contact will be direct between NA1SS and KD2IFR. The contact should be audible over the state of New York and adjacent areas. Interested parties are invited to listen in on the 145.80 MHz downlink. The contact is expected to be conducted in English. Welcome to the Central Islip Union Free School District – Home of the Musketeers and a proud Suffolk County, New York school system, where approximately 8,000 students in grades Pre-Kindergarten through 12 receive their formal education. Our School District’s motto is Children Our Future ~ Diversity Our Strength. The Central Islip Union Free School District is comprised of eight schools: one district-wide early childhood center, four elementary schools, two middle schools and a high school. The Hamlet of Central Islip is a vibrant, culturally-diverse community. A suburban community with urban demographics. We are a positive and progressive school district whose teachers are dedicated to helping students achieve their maximum potential and to develop academically and socially. Our district offers an array of afterschool activities including sports, music, theatre arts and much more. 1. What are the challenges of spending so many months constantly around the same people? 2. What is the best way to describe the feeling of zero gravity? 3. Have you experienced anything unexpected while in space that could not be explained? 4. Have you experienced any significant changes, either physically or emotionally, since being in space? 5. What type of robots do you use on the ISS and how are they helpful? 6. What is your advice for young people who want to become involved in programs at NASA? 7. What is the biggest challenge about being on a long duration space mission? 8. How does digestion in microgravity compare to digestion on Earth? 9. Have you experienced anything in space that has made you change your perspective on life? 10. Are there any plants aboard the ISS and if so, what’s different about how they meet their daily requirements? 11. What are the long term effects of reduced leg muscle use in long duration space travel? 12. Is your circadian rhythm affected by multiple sunrises and sunsets each 24 hour period, perhaps making it difficult to sleep for long periods of time? 13. Can you describe the types of training that prepared you for this mission? 14. Can you catch a cold on the Space Station? 15. Do the properties of light appear to be different in space? 16. Are there differences in how your body responds to physical exertion while in microgravity? 17. Would it be possible to transmit a mechanical wave on a rope onboard the space station or outside the station? 18. What are the hardest tasks to perform in space that are routine on Earth? 19. Could you blow a bigger than normal gum bubble in space? 20. Are there precautions that you take BEFORE going into space that can help to prevent bone weakness when you return? The primary goal of ARISS is to promote exploration of science, technology, engineering, and mathematics (STEM) topics by organizing scheduled contacts via amateur radio between crew members aboard the ISS and students in classrooms or informal education venues. With the help of experienced amateur radio volunteers, ISS crews speak directly with large audiences in a variety of public forums. Before and during these radio contacts, students, teachers, parents, and communities learn about space, space technologies, and amateur radio. For more information, see www.ariss.org, www.amsat.org, and www.arrl.org. This entry was posted in Ham Radio, News, Scanners and tagged Amateur Radio on the International Space Station (ARISS), ARISS, How to listen to the International Space Station, Icom ID-51a, Yaesu VX-3R on April 16, 2018 by Thomas. [The Yaesu VX-3R] is a neat little HT, but the Kenwood TH-F6A is way more versatile. How? Full 5W on 2m, 222MHz, and 440MHz, and will RX 150KHz to 1.3GHz in AM, FM, FM wide, NBFM, USB, LSB, and CW. All that in a size of a pack of cigs. Yes, it will overload easily, but something that wide banded and this small, I kind of expected that. However, want to hear what your wireless FM innercom sounds like on 175KHz? You can do that. Want to hear what your 222.1MHz transverter sounds like on SSB? You can do that. Need to tune-in to local AM / FM radio when power goes out? You can do that. Want to listen to CB CH19 truckers gripe about traffic conditions? You can do that. Want to listen to aircraft traffic at an air show? You can do that. You want to monitor 6M 50.125MHz USB to hear when that band opens? You can do that. No, it doesn’t have D-Star, DMR, Fusion, or even SW’s DRM, but analog-wise this HT is so versatile, what else is out there like it? Thanks for sharing your thoughts about the TH-F6A! 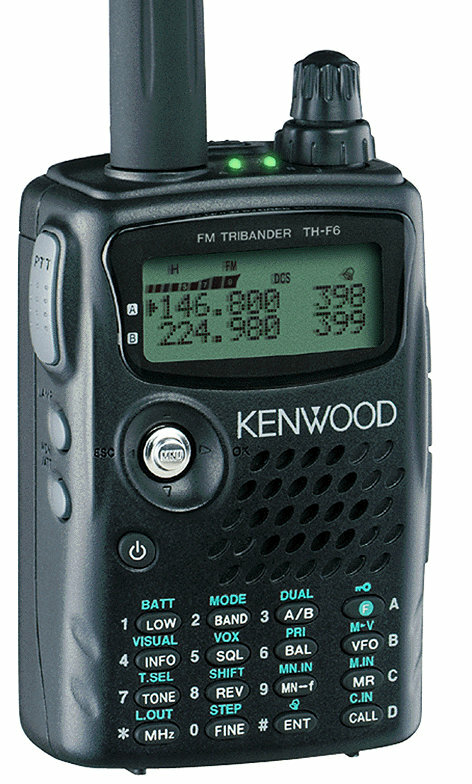 This entry was posted in Ham Radio, News, Portable Radio, Radios, Scanners, Shortwave Radio and tagged Handheld transceivers, Kenwood, Kenwood TH-F6A, Yaesu VX-3R on February 5, 2017 by Thomas. 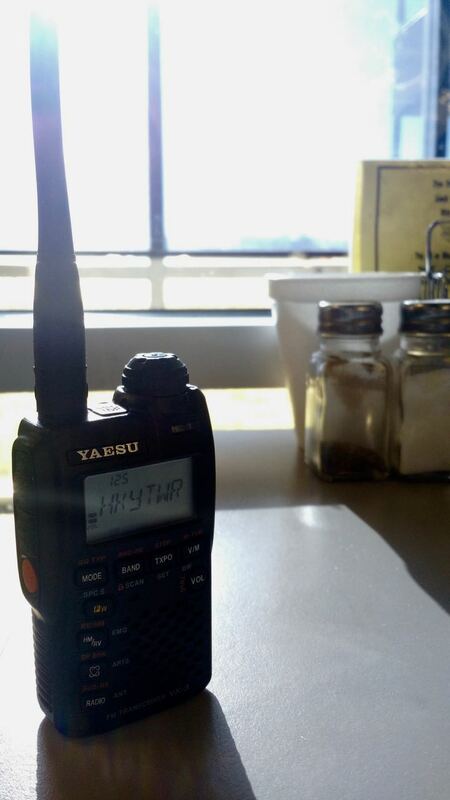 While I have a number of amateur radio handheld radios, one of my favorites is the recently-discontinued Yaesu VX-3R. Saturday morning, I took my father to the his local regional airport’s café (KHKY). It’s a frequent stop when I’m in town visiting. While sipping coffee, talking with friends and watching GA aircraft land and take off, I tuned to the airport’s tower. It was a pretty busy morning air traffic-wise and it was fun to monitor communications from our table with a view of the runway. While the little VX-3R lacks the power output of larger HTs, and doesn’t include digital modes like D-Star or DMR, it is dual-band (2M/70cm) and its wideband receiver covers the shortwave, FM and MW broadcast bands in a pinch. Best of all, the VX-3R is amazingly portable. 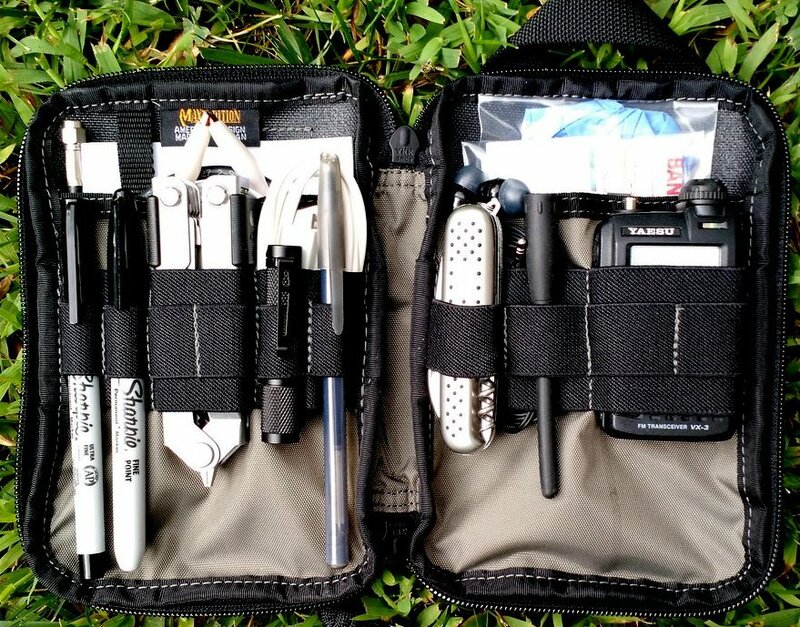 My Everyday Carry (EDC) pack, loaded with all of the essentials. I’ve used this little radio while traveling (hitting local repeaters and even simplex), I’ve monitored live air support during a local forest fire, and, on a moment’s notice, even caught an ARISS contact. This week, I decided it might make sense to purchase another VX-3R to carry in the glove compartment of my truck. Since I already know my way around this radio, and since I already have the software and programming cable through RT Systems--it seems to make sense. This model is being discontinued. We expect one more shipment in late February which will fill our back-orders. We are not accepting additional orders at this time. DX Engineering, Ham Radio Outlet and GigaParts also show no stock. I feel like $139 was a bargain for this versatile amateur HT. Late last night, a “New Open Box” unit appeared on eBay for $119 shipped. The seller had 100% positive feedback, so I snagged it. 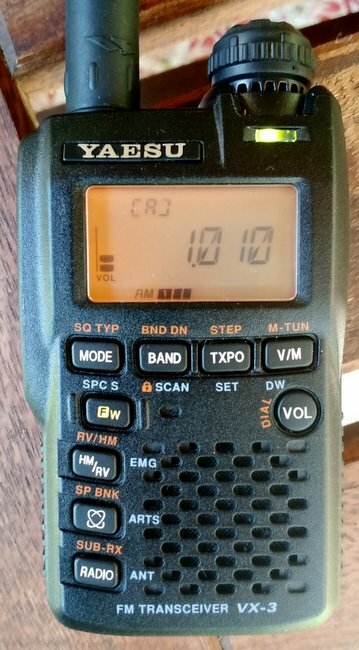 If you’re interested in the VX-3R, your best bet will be to check with radio retailers like Universal Radio and Ham Radio Outlet for used/demo units. Of course, you might also follow a VX-3R search on eBay. Post readers: Any other VX-3R owners in our community? Any other fans of monitoring ATC/aviation traffic? 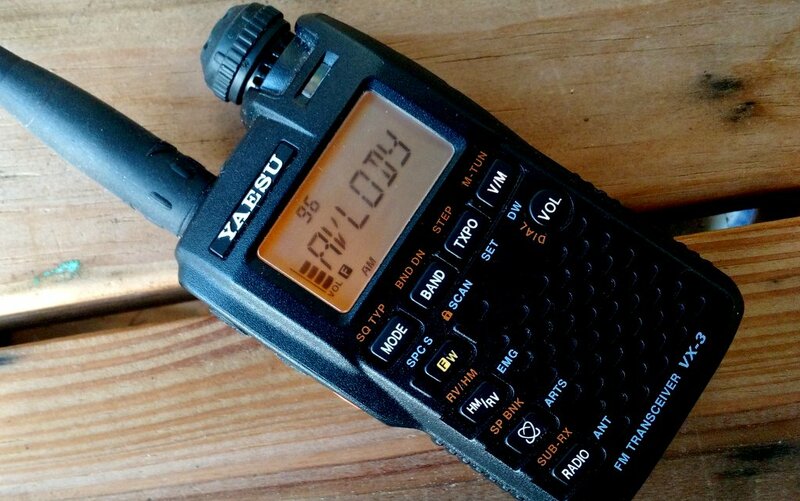 This entry was posted in Ham Radio, News, Radios, Scanners, Shortwave Radio and tagged Aviation Monitoring, Aviation Receivers, EDC, Everyday Carry, Everyday Carry Radios, KHKY, VX-3R, Yaesu, Yaesu VX-3R on February 2, 2017 by Thomas.